one of my favorite things to bake is cupcakes. i know... they are not swedish pasteries, BUT they are becoming more and more common in all our cafes and also when you go for fika at your friends houses. 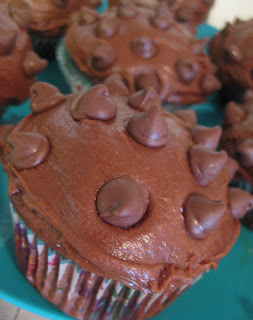 i have tried to find the best chocolate cupcake recipe for awhile and i realized that you sometimes need to mix recipies (http://www.kokaihop.se/recept/choklad-brownie-cupcakes-med-chokladfudgefrostinghttp://www.recept.nu/1.122128/leila_lindholm/kakor_tartor/choklad_cupcakes) and use your own imagination, so what can i say more then... enjoy! 1 st citron, skalet 1 lemon, just use the peal. 1. preheat the oven to 392 degrees fahrenheit/ 200 degrees celsius. 2. whip the eggs and the sugar until fluffy. melt the butter and let it cool for a bit. mix the butter, the sour cream and the vanilla extract with the dough. 3. mix all the dry ingredients; flour, cocoa powder, baking powder and salt. stir it into the dough, make sure you don´t whip it to hard, you don´t want the air to disappear. 4. i used some of my roomates leftover valentine chocolate, crushed it and stirred it into the dough. 5. place the muffin cups in a muffin pan and fill the cups 2/3 with dough. 6. put the muffin pan in the middle of the oven for about 15-20 minutes depending on how big your muffin cups are. 1. hand mix the melted butter with powered sugar and vanilla extract. 2. melt the dark chocolate (over boiled water) and pour it in with the other ingredients. use the hand mixer until the frosting is fluffy. then the best part starts, decorating. just use your imagination.